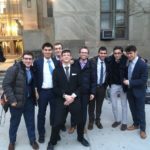 This Tuesday, the MTA Mock Trial team trekked to the New York County Criminal Courthouse at 100 Centre Street downtown once more, to compete against the Herbert H. Lehman High School in their final match of the season, this time acting as the Defense. This year’s case was a criminal trial where Carson Conners, the defendant, was charged with Disorderly Conduct for allegedly shoving another student in the school hallway. Noam Mayerfeld (‘19), David Brodskiy (‘19), and David Tanner (‘18) acted as the defense attorneys, while Elie Burg (‘18), Benny Mermel (‘19), and Nadav Heller (‘19) stepped into their roles as witnesses. Davi Hazan (‘19) honored the team by attending and acting as timekeeper. A tense trial followed, with opening statements, direct and cross examinations of the witnesses, objections and responses, submission of evidence, and closing statements. What made it all the more impressive was that several team members had taken the SAT earlier that morning! The ruling: Though MTA unfortunately lost and will not be proceeding in the tournament, it didn’t feel that way. One of the team members remarked, “Thanks to the tireless effort of our Coach, Noah Pollack, we made it to the top 32 schools in New York State!” We congratulate Noah Pollack on his first four-year cycle as MTA’s Mock Trial Team Coach, and thank the graduating Seniors, who will not be participating next year. Maybe next year MTA can make it to the “top 16”!